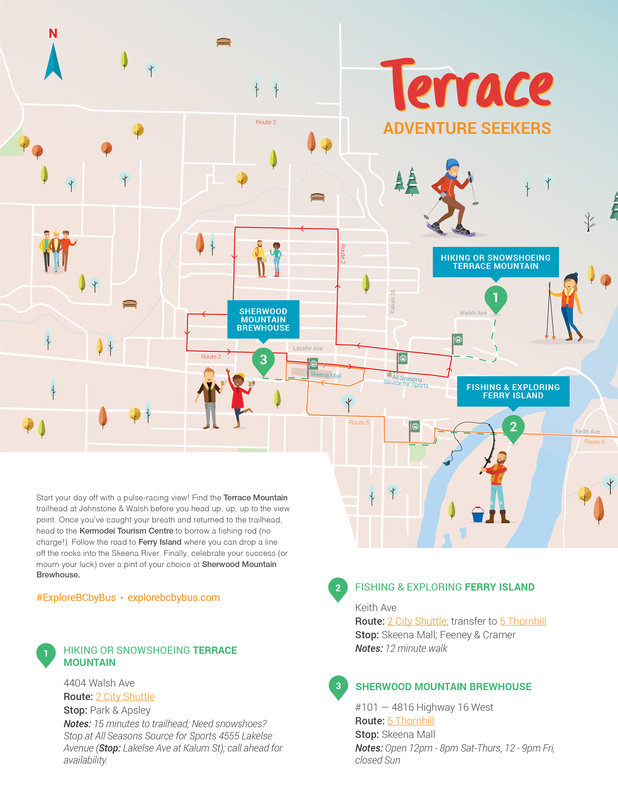 Calling all adventure seekers! Explore beautiful British Columbia with thrilling trips with BC Transit for the wild at heart. What are you waiting for? 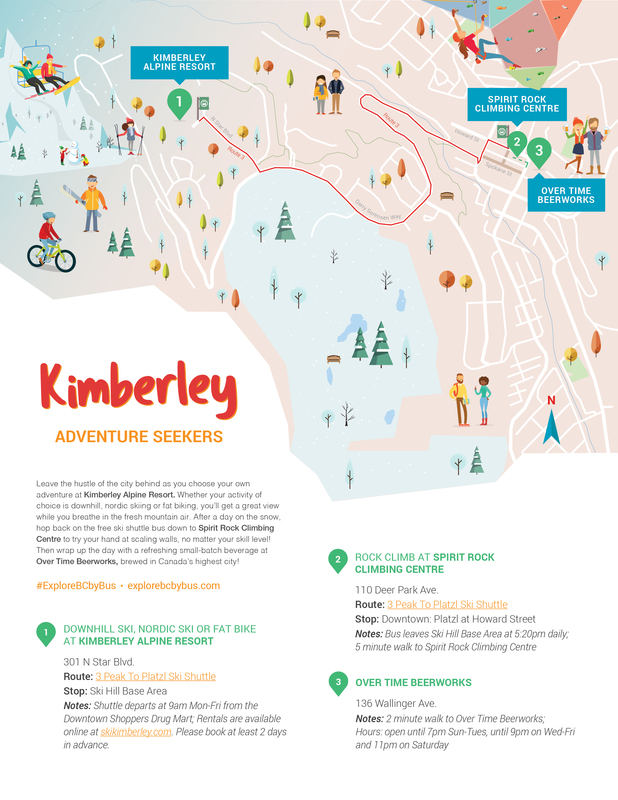 Choose your own adventure at Kimberley Alpine Resort – skiing, snowboarding, nordic, snowshoeing or fat biking! Next, take the free shuttle bus down to Spirit Rock Climbing Centre to test your vertical limits. Wrap up the day with a local beer from Over Time Beerworks, brewed in Canada’s highest city! Cast your line in the Somass River in the hopes of landing a trophy steelhead, or wander the area’s beautiful park along the river. Catch some views at the Harbour Quay clock tower, then head east to wander through Vancouver Island’s serene second growth forest. 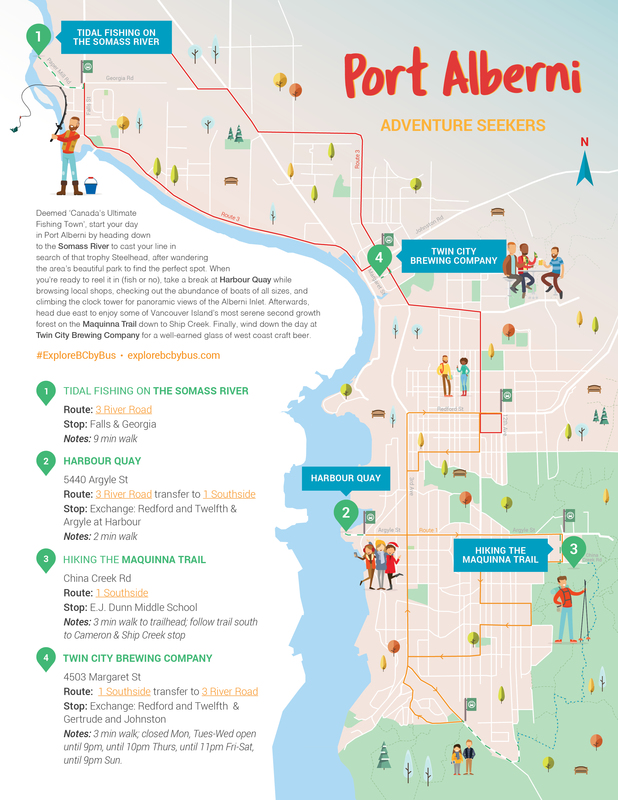 Finally, relax with a glass of west coast craft beer at Twin City Brewing. Enjoy a pulse-racing view after hiking or snowshoeing to the viewpoint on Terrace Mountain. Borrow a fishing rod from the Kermodei Tourism Centre and cast a line in the Skeena River from Ferry Island. Celebrate your day with a pint of your choice at Sherwood Mountain Brewhouse. 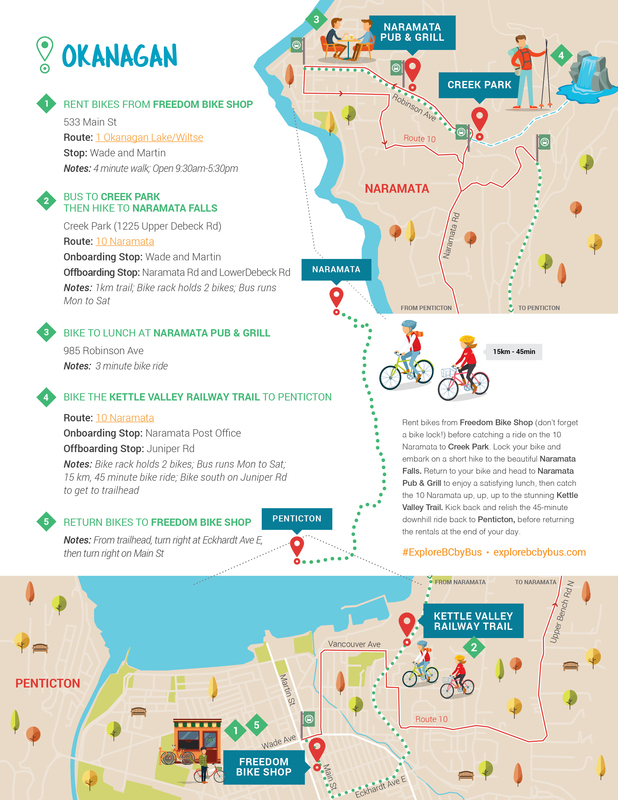 Begin your adventure by renting bikes in Penticton and catching a ride to Creek Park in Naramata. Lock your bike at the park entrance before embarking on a short hike to the beautiful Naramata Falls, then head to Naramata Pub & Grill to fuel up. Finally, hitch a ride on the bus up to the stunning Kettle Valley Railway trail to enjoy a downhill ride back to Penticton. 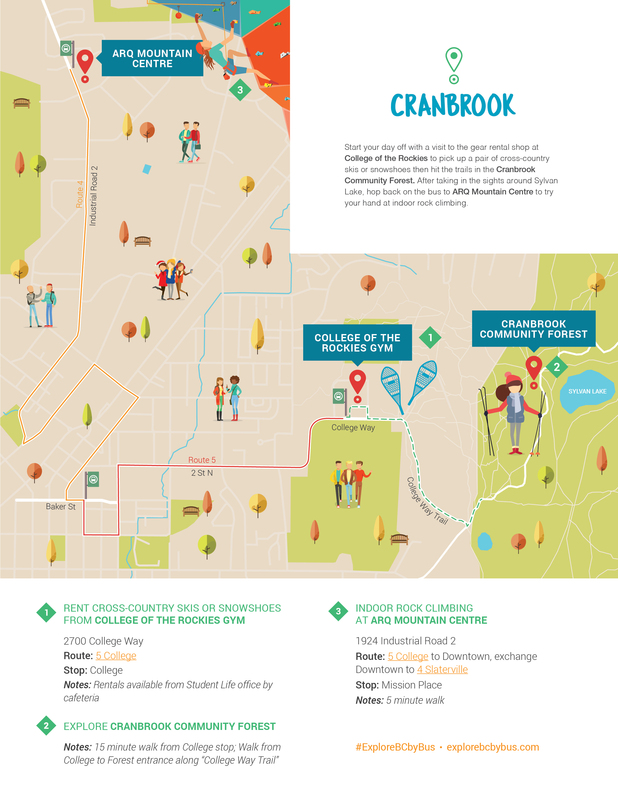 Start your day off at College of the Rockies to rent cross-country skis or snowshoes then hit the trails in the Cranbrook Community Forest. After taking in the sights around Sylvan Lake, head to ARQ Mountain Centre to try your hand at indoor rock climbing. Choose your own adventure! Take your pick between a snow day at the Hudson Bay Mountain Resort or a hike through Telkwa’s Tyhee Lake Provincial Park. Whatever you choose, it’s sure to be a day you’ll remember! 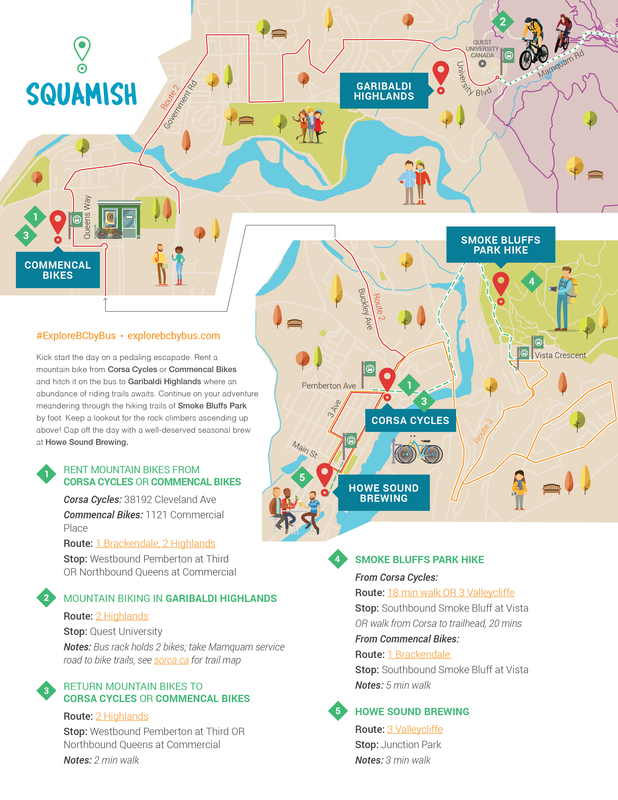 Kick start the day by renting a mountain bike and hitching it on the bus to Garibaldi Highlands where an abundance of riding trails awaits. 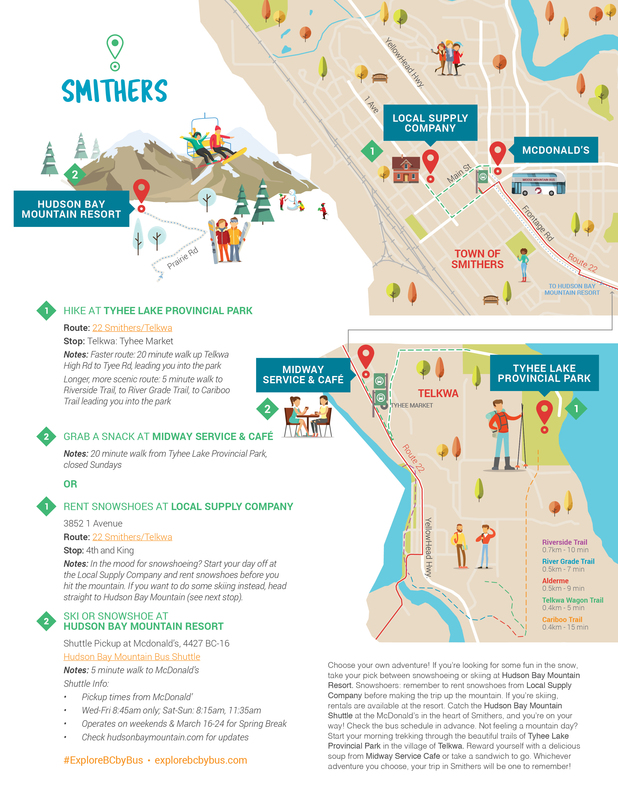 Then, head to the hiking trails of Smoke Bluffs Park before capping off the day with a well-deserved beverage at Howe Sound Brewing. 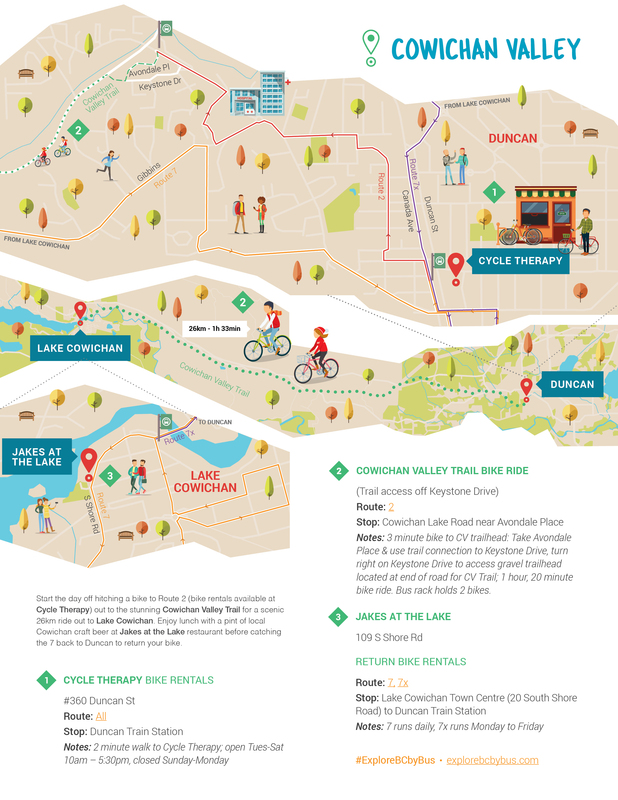 Rent a bike at Cycle Therapy and head out to the stunning Cowichan Valley Trail for a scenic 26km ride out to Lake Cowichan. Enjoy lunch with a pint of local craft beer at Jakes at the Lake before catching the bus back to Duncan to return your bike.